The only thing better than having multiple IoT ecosystems on a single chip is having them all on a single development board for testing. I mentioned in my previous blog post that our QCA4020 chip covers multiple ecosystems. You can focus on moving data among different kinds of IoT devices instead of sweating the details of connecting the devices. In this post, I’ll describe the development kit and demo apps built around the chip. The QCA4020 chip is available as a reference module from module vendors. In the development kit, the module is mounted on a PCB board equipped with sensors commonly used for IoT applications. 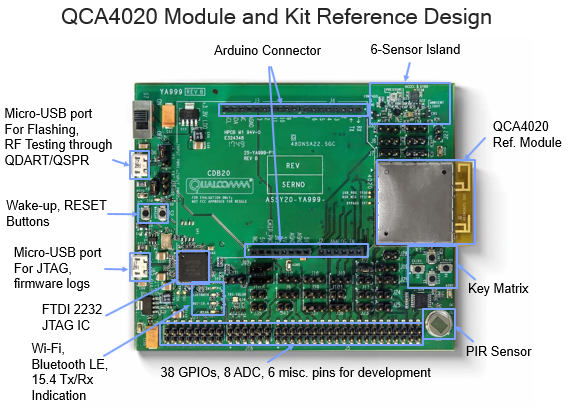 The development kit also includes physical interfaces for connecting to the QCA4020 reference module. Once you’ve built and tested your product on the development board, you’ll work with the module vendor to go into mass production. The QCA4020 includes radios for dual-band Wi-Fi, Bluetooth 5.0 low energy (BLE) and 802.15.4 (Zigbee 3.0 and Thread via OpenThread). In future posts in this series, I’ll go into connectivity and using Wi-Fi on the chip to connect to Amazon Web Services (AWS) IoT and Azure IoT. You can use the board’s headers as test points for power and other measurements, for direct connection to a battery and for reading the boot configuration. The Arduino connector is designed to allow you to add shields and extend the functionality of the kit. Most important to start IoT programming, the SDK includes several demo apps highlighting consumer and industrial use cases on the QCA4020. I’ll describe two of them here. In a Wi-Fi AP session, the AP interface can be used for Wi-Fi, Bluetooth LE and Thread/Zigbee devices. In a Bluetooth 5 session, a secure Bluetooth 5 link — with or without the passkey — can be used for all Wi-Fi, Bluetooth LE and Thread/Zigbee devices. The demo also allows for using a QR code to password-protect the AP or Bluetooth LE link. This demo features end-to-end communication between the QCA4020 (over a Wi-Fi and MQTT connection) and AWS. A mobile app receives sensor value updates (temperature, pressure, humidity) from the development kit through the AWS IoT sensor shadow and displays them. You’ll also find a UART-AT demo for communicating with an external MCU, and an AWS cloud/mesh networking demo with browser-based dashboard. For details on all of the demos included in the QCA4020 SDK, have a look at “Getting Started” in the QCA402x (CDB2x) Development Kit User Guide. We have posted several QCA4020 projects to help you get developing quickly, including a walk-through of the Hello World demo, onboarding demos, and even demos featuring a smoke detector and Zigbee lamp. Be sure to check them out for inspiration on your next project. And be sure to be on the lookout for upcoming posts in this series on QCA4020. Be sure you’ve subscribed to the Qualcomm Developer Network blog for articles on IoT-related topics like cloud connectivity, security and Bluetooth 5.0. Meanwhile, order your QCA4020 development kit now. QCA4020 is a product of Qualcomm Technologies, Inc. and/or its subsidiaries. Kiran Koshy is Director of Business Development, responsible for leading Qualcomm Technologies, Inc. connectivity products for IoT (Internet of Things) applications into broad distribution. Kiran holds an MBA from Emory University and MSEE from Arizona State University.